Always right near the sea. 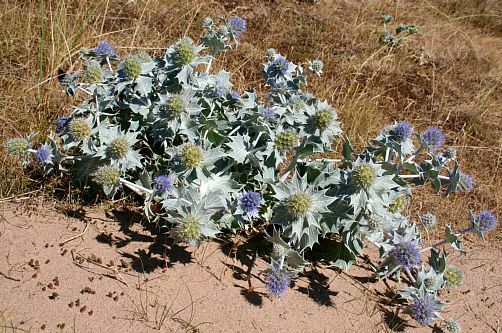 Grows on semi-mobile sand dunes and pebbly shores. 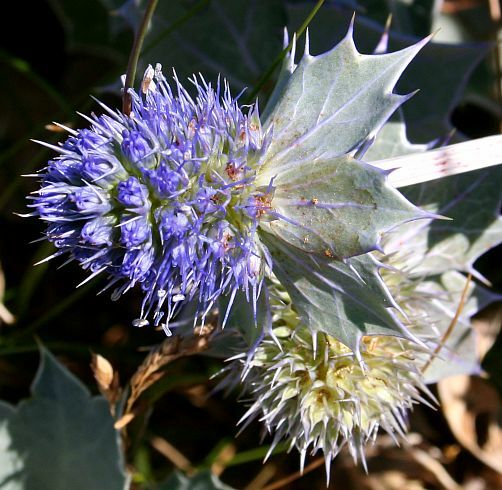 Has spiny blue-green leaves with a whorl of sharply spiny bracts just below the flower-head. The leaves of younger plants are more pf a sea-green rather than blue-green. 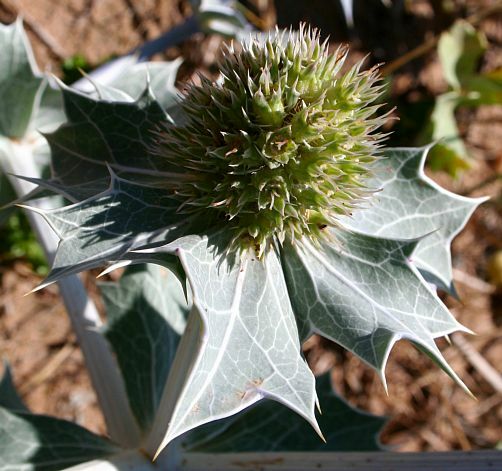 Sea-Holly is an Umbellifer, but un-typical of umbellifers; the flower umbels are shaped into a globe. The flowers are a bright powder-blue, almost ultramarine. The ridged stems are also suffused with a steely blue. Round stems deeply ridged all around. White filaments extend from the florets with a darker-blue T-bar anther atop. Flowers occur as clumps of five in the flowerhead, more easily seen before they open. Interspersed between the clumps are three-spined barbs, to deter herbivores. The spines are sharly vicious and protrude. The stem leaves tend to wrap all around the stem, perfoliata style. 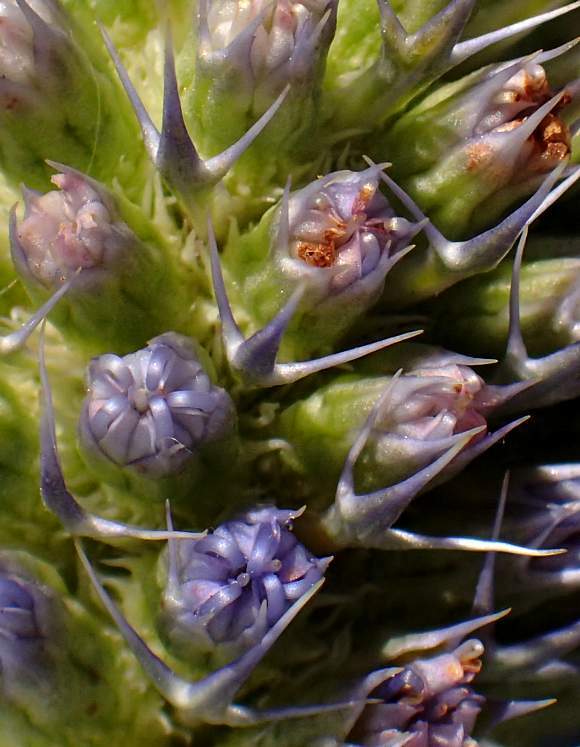 The lobed and coarsely-toothed bracts just below and surrounding the flower have white veins and very sharp spines. 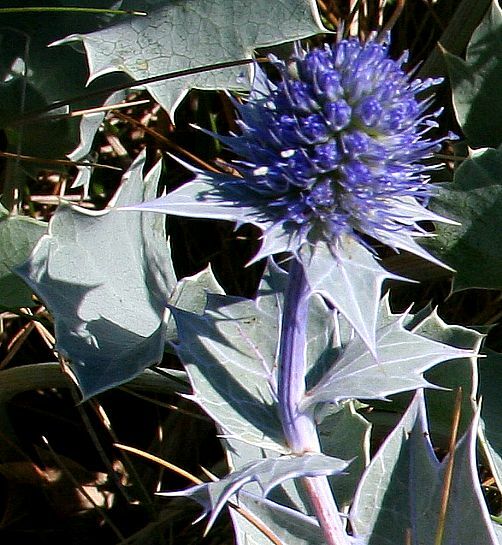 The lobes are broader than most other Eryngium species. Uniquely identifiable characteristics : there is no other plant quite like this. No relation to : Holly [a plant with similar name]. 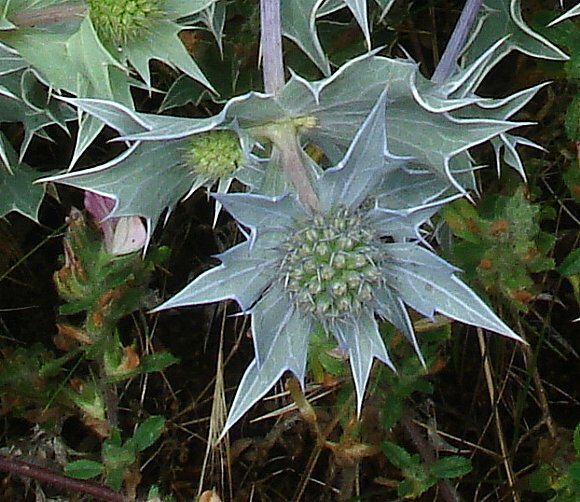 Although Sea-Holly has sharply pointed and deeply cusped leaves reminiscent of Holly, it belongs to the umbelliferous [apiaceae] family of plants. 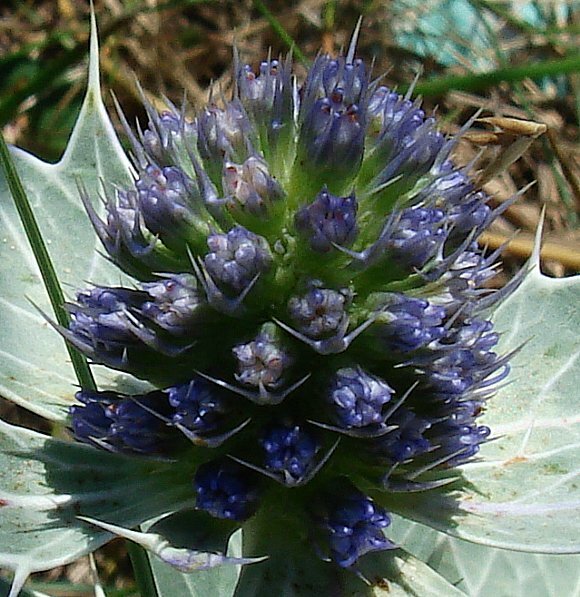 Field Eryngo (Eryngium campestre) which has much narrower spiny leaves, leaves pale green, white rather than ultramarine blue flowers, and grows in dry and grassy places rather than right by the sea. 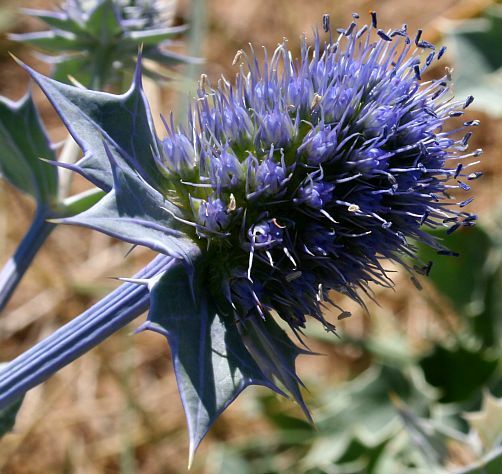 Blue Globe-Thistle (Echinops bannaticus) which has spherical steel-blue flower-heads but the leaves are not steel-blue and the plant belongs in a differing genus. 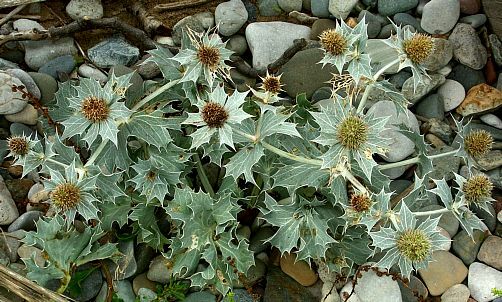 The roots of Sea-Holly were once boiled then candied in sugar, to be eaten as a sweet (Eryngo Roots), much like the stems of (Garden) Angelica are today. 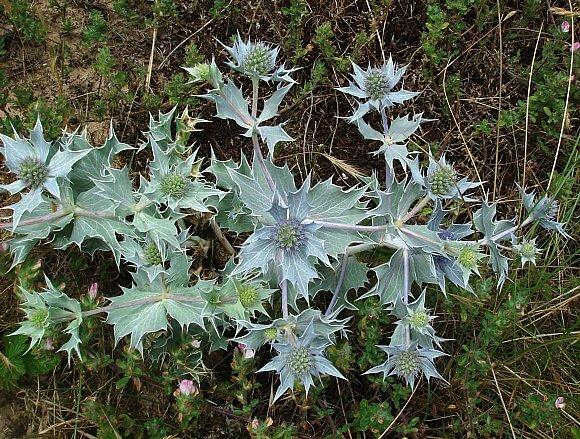 In Elizabethan times the Elizabethans believed the roots of Sea-Holly to be a strong aphrodisiac. 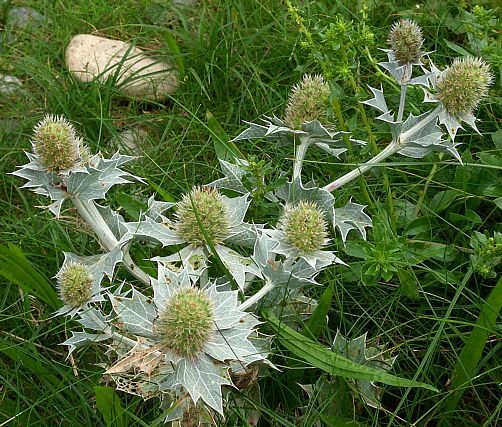 Indeed, the Romany Gypsies would give Sea-Holly to their stud stallions to make them more virile; a viagra for horses. 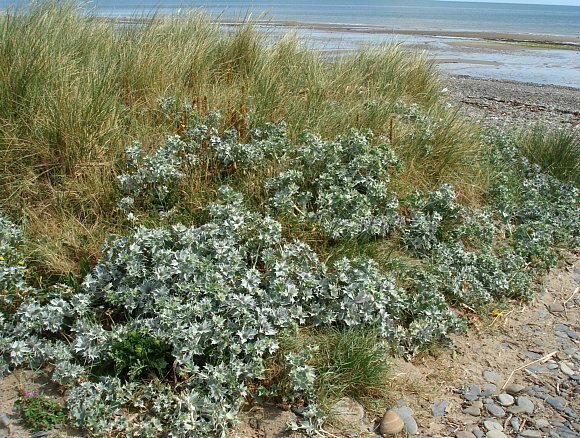 A seaside plant that grows very close to the sea, either on mobile sand dunes, or pebbly beaches or on shingle. It belongs to the umbellifers (apiaceae) but is not typical of such. The umbel of flowers is globular in form rather than flat. The fruits are egg-shaped with hooked spines. 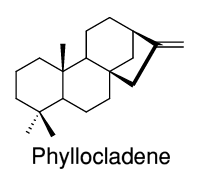 γ-Muurorolene, which is a cadinene (a sesquiterpene with the cadalane skeleton) is a hydrocarbon with a distinctive smell found in Sea-holly, amongst some other plants. 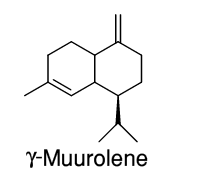 Muurolene exists as two stereo-isomers, α-Muurolene and γ-Muurolene , both of which are used in the manufacture of flavouring agents for the food industry. It has a very similar chemical structure to that of the Germacrene s such as Germacrene D.